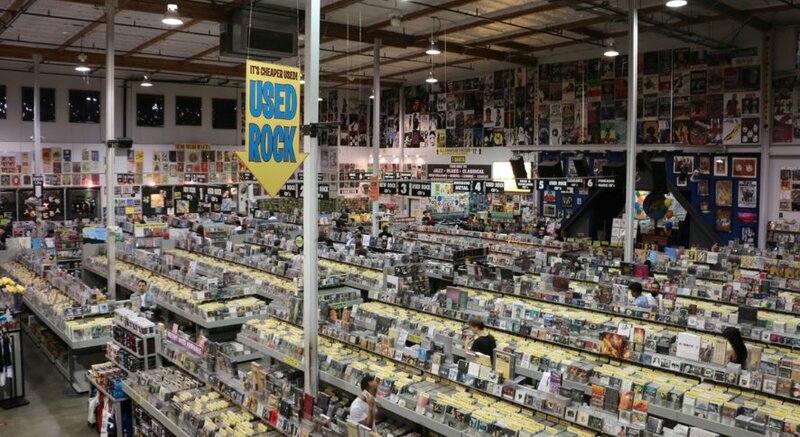 Interior of Amoeba Hollywood. Photo by Brian Champlin / We Like L.A.
You know what’s handy? Waking up in the morning, firing up your phone/computer and being able to scan a super quick (but curated) rundown of the best of what lies ahead. So here it is, our list of fun things to do in Los Angeles for today, Tuesday, February 5, 2019. 2. [1 p.m.] LACMA will screen the 1969 film Easy Rider directed by Dennis Hopper and staring Hopper, Peter Fonda and Jack Nicholson about two Harley riders embarking on a cross-country search for spiritual truth. 5. [7 p.m.] There’s a Golden Girls Trivia Night happening at Hamburger Mary’s in West Hollywood this Tuesday. 7. [8 p.m.] Watch Doctor Who with your fellow Whovians this Tuesday night at Fox & Hounds. They’ll be showing the Eleventh Doctor two part episode “The Time of Angels/Flesh and Stone” on every TV as well as two big projectors inside and outside the bar. Drink special password is “TARDIS” and gets you $4 draft beer and $1 off wine and well drinks. 8. [9 p.m.] Emo Nite at Echo & Echoplex.